It’s something of a coup persuading renowned ‘car guy’ and omnipresenting talk show host Jay Leno to front the launch of a new flagship model. To then broadcast the event, staged at Chelsea’s Saatchi Gallery, live on the internet lends an air of forward thinking and technosavvy branding. Yet it wasn’t one of the luxury-meets-engineering powerhouses of Germany that was behind this July 2009 bandwidth sapping online event, but traditional old Jaguar from the British Midlands. 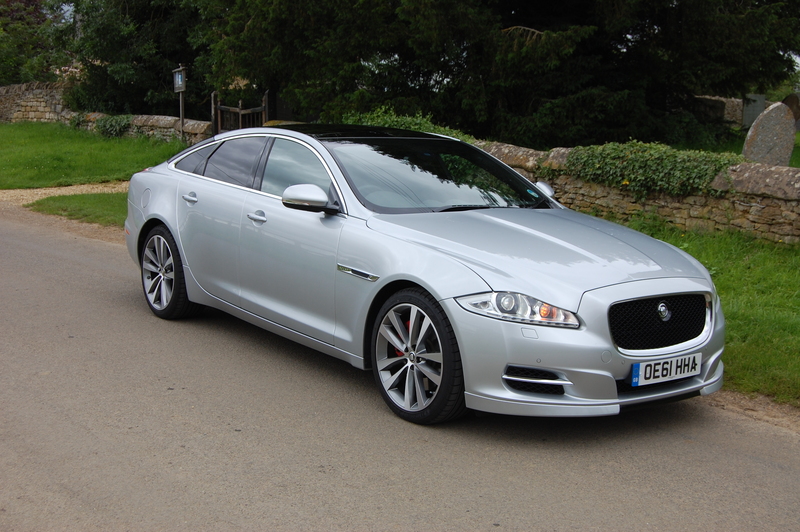 The car in question was the all-new XJ, the largest saloon in the Jaguar family. Leno’s enthusiasm was almost tangible, after all here’s a man with one of the largest private collections of cars in the world. But it wasn’t a smile and swagger of someone who’d just pocketed a nicely sized cheque from the British paymasters, it was someone captivated by Ian Callum’s latest creation writ large in full sized luxury saloon form. This latest XJ seems to have taken a little while to catch on with plutocrats spending their vast sums on a suitably status confirming leviathan. Is it the shock of the new? 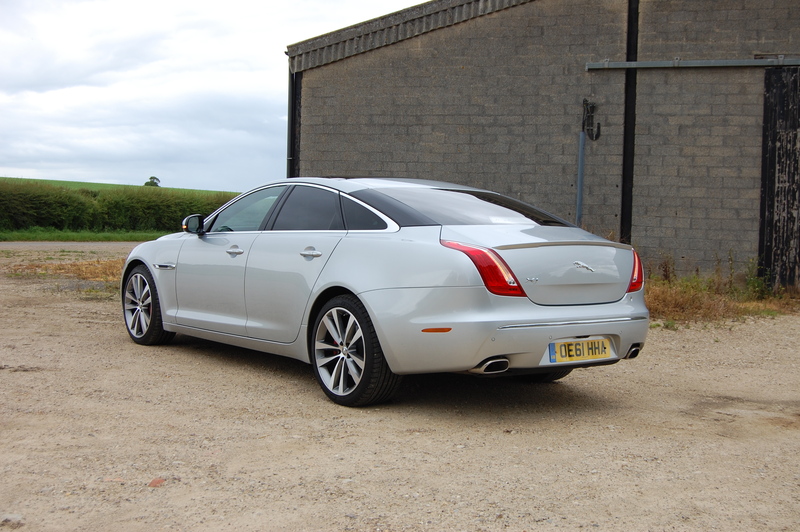 The latest XJ’s certainly a bold statement – has it been too bold for the market? Callum’s reinterpretation of the iconic XJ line is one which seeks to recapture Jaguar’s once proud image of being a forward thinking firm. Reading between the lines we’re supposed to view the latest model as a new imagining of how that original ’68 XJ6 might have evolved had its styling direction not stagnated over the intervening 40 years. As Loyd Grossman might say, the clues are there: the deep, squarer grille, the high waisted haunches, the luxurious modernity. We don’t immediately recognise it as XJ-like because of those four decades of safe and steady design development. Until the latest model the most radical XJ was the 1986 XJ40 range and in retrospect that’s just a squarer trans-Atlantic pastiche of the models before it. 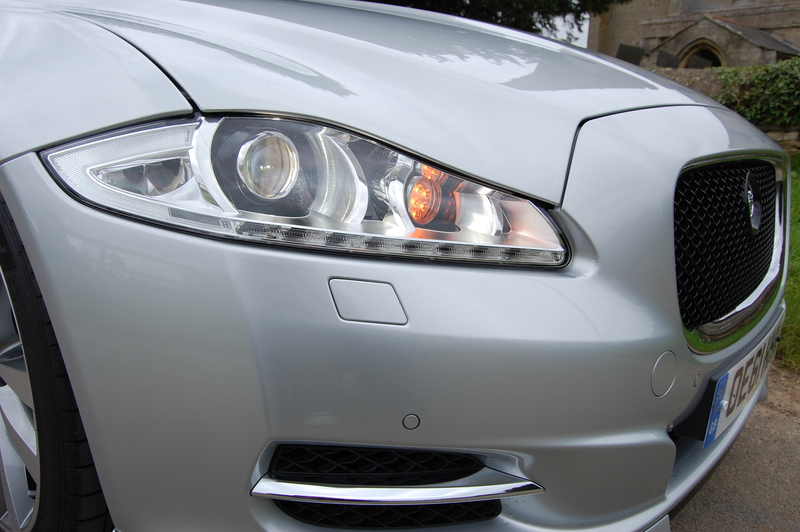 Arguably Jaguar missed a trick with the 2003 model. Underneath it was state of the art utilising the latest technologies in aluminium construction but outside it was another Geoff Lawson styled saloon – a retro beautiful Traduar. The ingredients for the latest XJ to be a stylistic winner are all there not least the bold, aggressive face, slinky and sheer body sides and a coupe like silhouette but like many departures from what’s gone before, the pin of controversy burst the bubble of perfection. Let’s not get carried away – it’s no Chris Bangle 7 Series where Bavarian die hards tried in vain to genuinely enjoy the styling of two consecutive body sections – the XJ’s issue is those blacked out D-pillars. The visual effect is supposed to suggest the rear screen wraps around over the superstructure. Expense and productionisation insist that two black polycarbonate sheaths instead mask the pillars. From a distance it’s hard to tell but close up it’s clearly three separate components across the rear. This is always going to be subjective and personally I’ve loved the latest XJ, D-pillars and all, right from that early summer ’09 unveiling. And judging by the growing number you spot, a greater number are beginning to share the joy too. There’s a rightness and specialness about the XJ that makes the 7 look heavy, the S-Class too safe and the A8 a bit too… Oh hang on, that was an A6. Jaguar has fettled this test XJ’s exterior by fitting a sports pack which includes subtle extensions to the front bumper, side sills and a vestigial strip of extended plastic on the boot lid. Completing the transformation is a black finish to the mesh front grille and red brake callipers hollering through the beautiful 20” Venom design alloys. It looks purposeful without being overly brash. So it looks achingly contemporary from the outside, is the inside Trad Jag or something more up to date? Open one of the colossal doors and the XJ’s cabin reeks of rich, sumptuous leather but in a very different style to Jaguar saloons of recent times. Certainly the smaller XF range set a tone of modernity from Jaguar but rather than fit the XJ with a derivation of its smaller sibling’s interior, the larger model enjoys something different. Wood on this version has had its usual nestling places on the doors and dash usurped by slabs of carbon fibre trim. 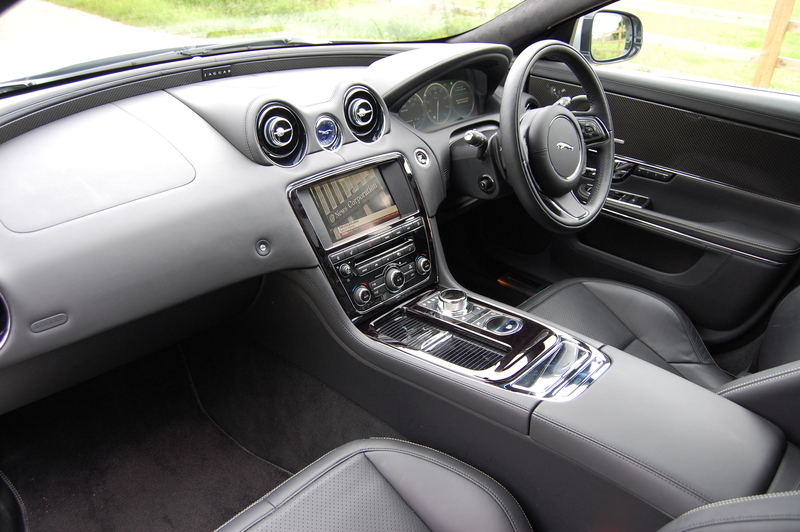 Combined with the Jet Black leather sports interior, the worked over interior styling complements the pumped exterior. But it’s the design of the interior that makes it feel special and Jaguaresque. 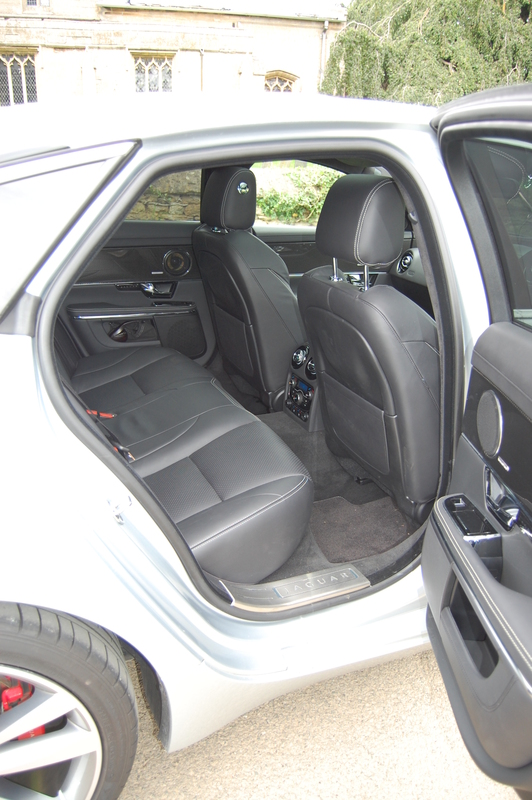 It’s spacious enough for five adults in standard wheelbase form but it remains cosy like its forebears. Up front the high central tunnel emphasises the snugness of the cabin yet there’s enough air around your limbs and head to ensure it doesn’t feel cramped. The seats themselves are adjustable on a range of planes ensuring comfort is just a few clicks and whirrs of electric motors away, whilst the dash in front looks modern and bold. Those bulging circular air vents, optionally illuminated in a phosphorous blue glow, are an unusual centrepiece but below is the touch screen for virtually all the controls, sat nav and the dual-view television, allowing the front seat passenger to watch programmes of their choosing whilst the driver remains blissfully unaware as they study the computer generated map. Minor switchgear lies below for old fashioned control of ventilation and other functions; this, like the column stalks and further controls work beautifully. The damping is precise and effective encouraging you to play with buttons at traffic lights for the pure pleasure of doing so. Even the rubberised tactility of them wills you to at least stroke them. 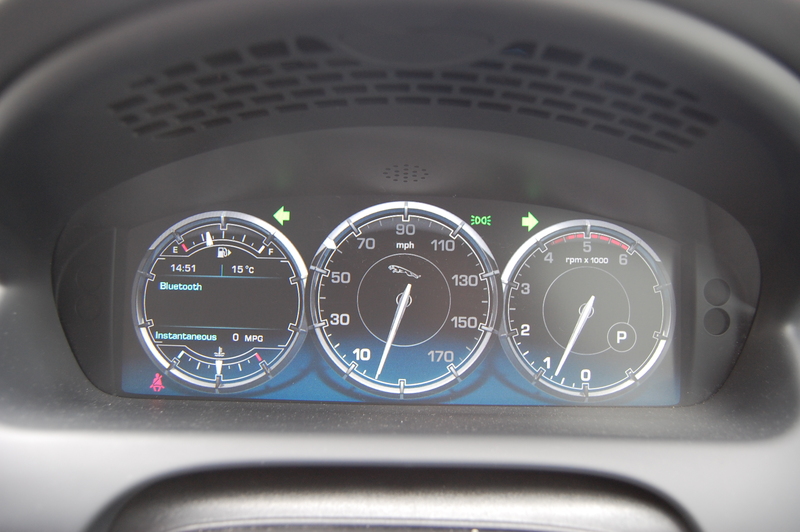 Right in front of the driver is the XJ’s technological tour de force – the TFT instrumentation. 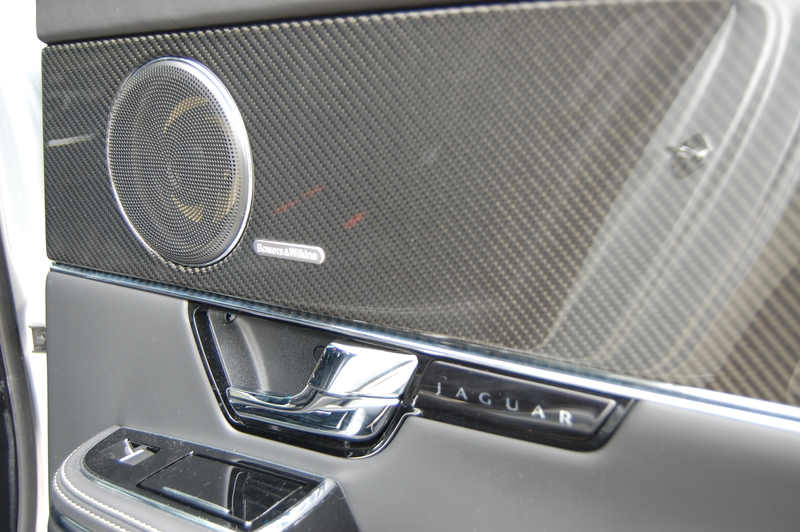 There are no ‘real’ dials in the Jaguar’s binnacle just a series of virtual ones which change their appearance, hue and position as settings are flicked between. They’re beautifully designed and work well but they’re difficult to love, looking a little too fake to be wholly embraced. Perhaps if they’d gone ultra modern with those too they’d be raved about. Pop back outside to the boot and the XJ falls into the trap of many contemporary saloons with a small aperture leading the way to a cavernous load space. 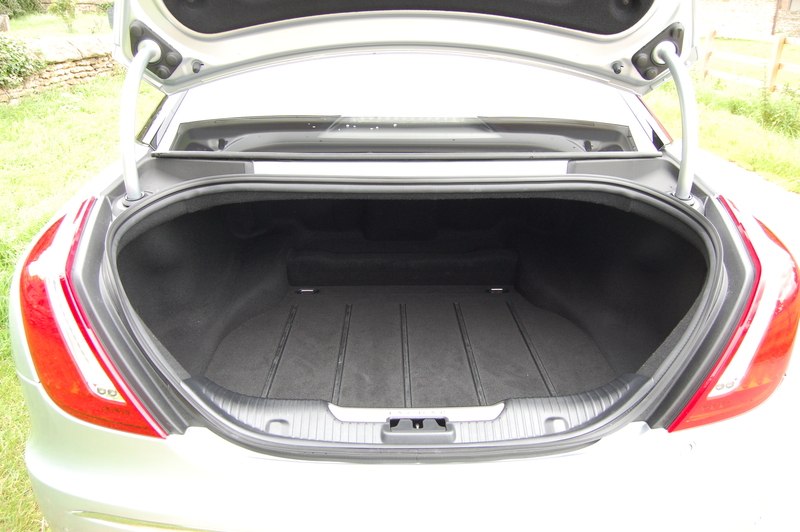 Yes, you read that correctly – a Jaguar XJ with a big boot, all 520 litres of useable space. Achingly beautifully resolved that tapering tail might be but you’ll need primate long arms to scuttle about collecting belongings that mischievously hug the rear seat back. 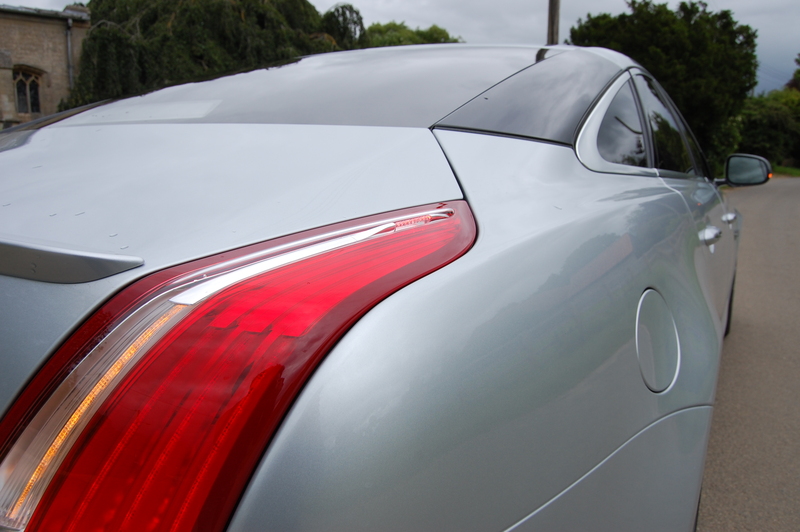 For all the boot lid, and its opening, is short, it’s also wide and framed by those distinctive rear lamps, the graphics on which are said to represent the claw marks of a big cat when illuminated. There’s a big cat on the grille – does this XJ have a growler under the bonnet? 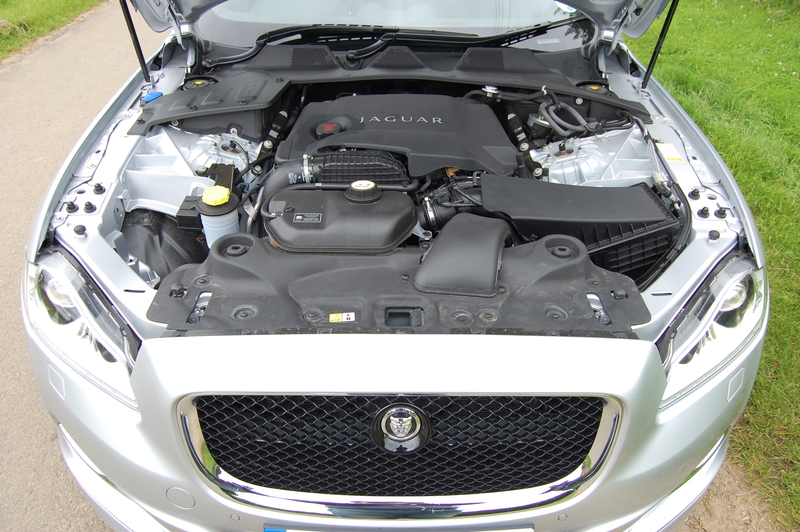 Lift the enormous, gas strut supported bonnet and underneath beats diesel heart in this Jaguar. Don’t be fooled into thinking that because it’s shared with its Land Rover cousins that it’s in some way agricultural – this is a state of the art V6 common rail unit. Its 3-litre capacity produces 275bhp with ease but what makes the XJ so driveable is the flexibility of the powertrain with 442 lb/ft of torque delivering its drive to the rear wheels through a six-speed automatic gearbox. Other models in the XJ line-up have already migrated to ZF’s newer and almost seamless eight-speeder, but this older ‘box still performs admirably in this installation. 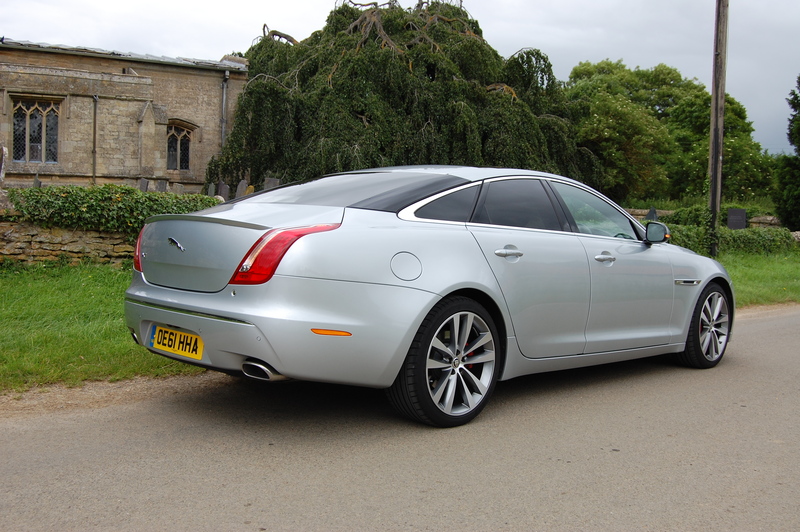 The drive is free from transmission jerk with an instantaneous pick up from the throttle, easing forward effortlessly feels intuitive but being a Jaguar this is also a sports saloon that belies its size. Make no mistake, it’s not as nimble or playful as the smaller XF and it’s definitely placed a greater emphasis on comfort as this market segment demands, but the XJ remains a car you can an indecent amount of fun with. Through the perfectly diametered steering wheel rim the road talks opening to your fingertips, the sensation not sullied by torque steer or over assistance from the power running through it. Changes of direction are quick, the steering remaining neutral until the rear end eases towards breaking away as it’s hustled through bends. The XJ combines those rare qualities of a car that feels satisfying as a B-road tool or as a motorway missile for effortless cruising. 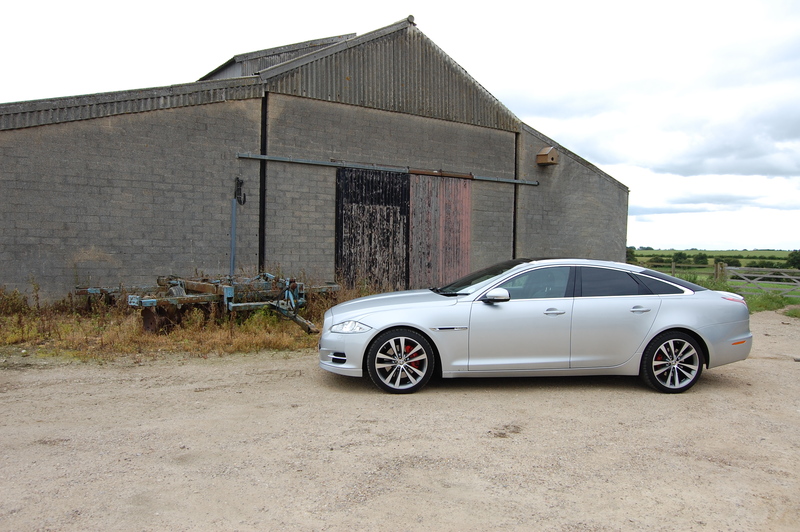 Ride quality, one of Jaguar’s hallmarks, is very good on the XJ. Which is to say it wasn’t sublimely comfortable. Whether running 20” wheels with shallow sidewalled rubber is the sole culprit is debatable, Jaguar recently announcing 2013 model XJs will have modified settings. It’s unlikely that current Jaguar drivers will find the ride firmness a rude awakening because the engineers have worked their usual springing and damping alchemy to ensure it rides and handles in a way that leaves other cars feeling under-developed. 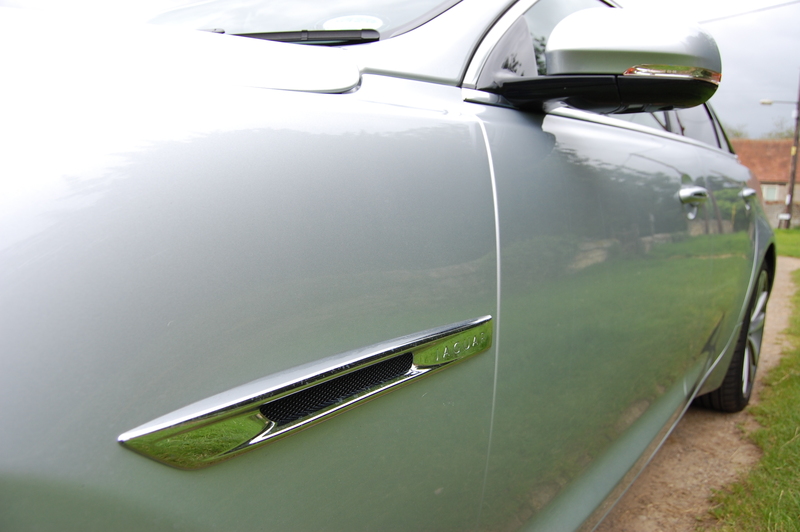 There’s no harshness or jarring to jolt the Jaguar’s occupants but that final ‘nth’ of suppleness is missing in action. And it performs well whether schmoozing around urban environs or eating up miles on longer journeys. The V6 diesel’s flexibility allows it to perform quietly and smoothly whatever the speed demands that are placed upon it. Floor the throttle and you’re greeted not by the raucous clatter of a barn full of angry tractors but instead by roar of grunt, bellowing from the twin exhausts. There’s the merest hint of diesel thrum in the background but not so much that it spoils your enjoyment from within the leather enveloped interior. The surge of performance is most un-diesel like too, thrusting to 60mph in less than six seconds yet returning a claimed average of 46.3mpg. Rarely are these figures matched in the real world and the Jaguar didn’t disappoint in failing to either but for a car of this size over all manner of road types, 38mpg was a pleasant surprise. Efficient drive train and lightweight alloy construction in unison. In a single act, decades of Jaguar’s XJ being something of an also ran, bought predominantly by those who appreciated aesthetics and impossibly smooth rides above all else, came to an end. The latest model not only looks sensational but is superior in terms of build quality, refinement, space and technology than its predecessor but now sits on an equal, if not superior, footing to its chief rivals. No longer if you’re considering an XJ do you have to play your beauty joker when explaining your purchasing decision. There’s a reason the latest Jaguar XJ is becoming more popular – more champions of industry are ‘getting it’, understanding that it represents modernity combined with elegance. It needs no justification nor explanation when it purrs up to a venue. The XJ is the epitome of contemporary cool – and when since the late 1960s has anyone been able to say that with conviction? Grace, pace and space is back. Thumbs Up: Bold styling, sumptuous interior, build quality, technology, speed and efficiency, special. Thumbs Down: D-pillar, lack of realism to the instruments, ride not as cosseting as previous XJs. Jaguar’s XJ range starts at £56,260 for the 3.0 V6 Diesel Luxury up to £121,980 for the long wheelbase 5.0 V8 Supercharged Ultimate.